May Movie Night for compost month – Dirt! 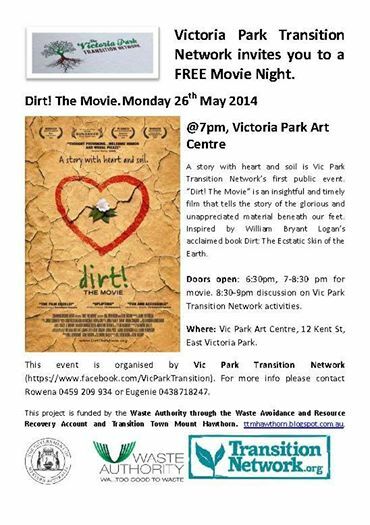 For Compost month Transition Town Guildford will be teaming up with other Transition groups around Perth to screen the movie Dirt! “Dirt! The Movie is an insightful and timely film that tells the story of the glorious and unappreciated material beneath our feet. If you can’t make our event, you can join Transition Town Mt Hawthorne on Thursday 15 May – Mount Hawthorn Community Centre, 197 Scarborough Beach Road, Mount Hawthorn, Lesser Hall (downstairs). Doors open 6:30, movie from 7pm, composting information after movie. Or Vic Park Transition Network on Monday 26th May – Victoria Park Art Centre, 12 Kent street, East Victoria Park. Doors open 6:30. Movie 7 -8:30 pm followed by discussion 8:30 – 9 pm. This entry was posted in Environment, Event, Food, Gardening, Movies and tagged Compost month, Dirt! the movie, Stirling Arms Hotel, Transition movies, Transition Town Mt Hawthorn, Vic Park Transition Network, WA Waste Authority. Bookmark the permalink.